It was back in the first round of the 2016 IGA League season that South Adelaide last faced the Glenelg Tigers. 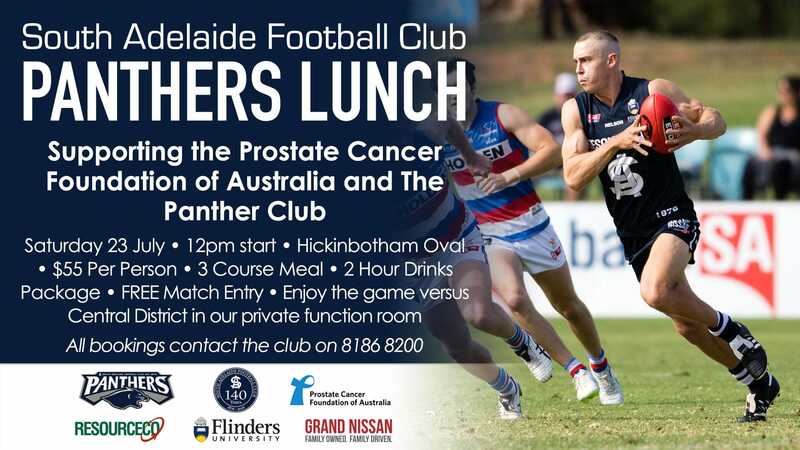 We kicked off the season on Good Friday in front of a raucous blue and white crowd at Hickinbotham oval and the game didn't disappoint - the Panthers leaving the field with a hard-fought nine-point win. Glenelg looked the better of the two sides early, running out to an 18 point lead in the first four minutes of the game. However, South soon regained their composure and led by the electrifying play of Emmanuel Irra, were able to work themselves back into the game and take a two point lead into the first break. Dubbed the "Excitement Machine" by senior coach, Brad Gotch after a strong pre-season, his elusiveness and ability to take the game on made him the clear standout performer in round one, finishing with 23 disposals and two goals. Joel Cross and Nick Liddle were the leading ball winners around the ground with 26 disposals a piece. Their experience and class at the stoppages were instrumental in South regaining control of the match. Meanwhile, Cross also delighted Panthers fans with two long-range goals during a third term goal blitz from South. The match ended with South leading the way by nine points despite only having one more scoring shot and five less inside 50's than Glenelg. As has been their trademark in each of their wins this season, the Panthers accuracy in front of goal and pressure on the ball in defense (finishing the game with a +16 differential in tackles) was the makings of an exciting victory. Coming into Round 15 South will have some interesting decisions to make at the selection table. Cameron Hitchcock (hamstring), Ben Haren (calf), Nic Schwarz (concussion/head cut) and Nathan Daniel (concussion) have all been listed as tests following Round 14 and will need to prove their fitness to return to the lineup against the Tigers. Meanwhile, Pat Kerin will unfortunately be out for eight weeks thanks to an ankle injury suffered against the Eagles Reserves in Round 13, while Peter Rolfe's expected return from a torn ACL suffered last season is still undetermined after suffering a hamstring setback. The Tigers first team options in Rhys O'Keefe (hamstring) and James Seller (concussion) will be tested this week to determine whether they are available. Whilst the clubs captain, Andrew Bradley is set to miss 10 weeks with a shoulder injury and key defender Chris Curran 1-2 weeks with a hamstring injury. After not being in the side we faced in round one the Panthers will have to watch out for midfielder Jack Haarsma (formerly from the Port Adelaide Magpies), who has been in good form in the last few rounds. Meanwhile, West End State Team livewire Willie Rioli is always a danger man to keep an eye on. For a full injury list for every SANFL team go to the SANFL website. Stay tuned to safc.com.au on Thursday evening for the official Round 15 teams for all grades. After winning at home against the Tigers in Round One the Panthers now head out to Gliderol Stadium on Saturday for the Round 15 rematch. Last week South ended their three-game losing streak away from home, defeating the Norwood Redlegs at Coopers Stadium by 29 points. For the full match review click here. Meanwhile, Glenelg had a week to recover and analyze the competition after going down to West Adelaide in a two-point thriller in Round 13. Yet again Round 15 provides an important opportunity for South to record another win against one of the teams who find themselves in the bottom five of the ladder. With first-placed Sturt and fourth-placed Adelaide facing off this week, it provides the Panthers with a great opportunity to consolidate their place at the upper end of the ladder. If South is able to come away with a crucial away win and Sturt lose, it will mean they will be one game closer to the top of the ladder. If South and Sturt win, the Panthers will still be able to add another two premiership points to their advantage over fourth-placed Adelaide. Either way this week is an important one as South Adelaide enters a difficult end to the season with games against top 5 teams in Sturt, Adelaide and Central District. 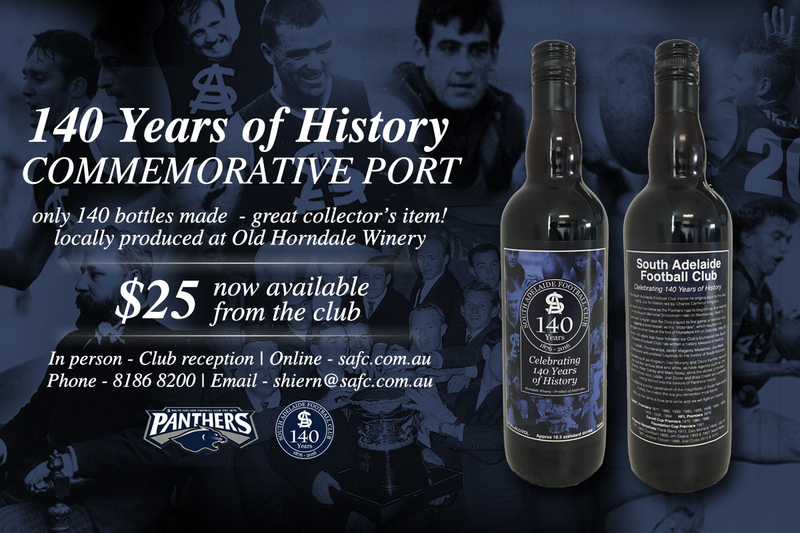 As we know, come finals time, every premiership point counts. South's season has been defined by their resilience and ability to bounce back when challenged. However, South have also been slow out of the gate on numerous occasions and have often found themselves behind after the first few goals of the game. This was certainly the case last time we faced Glenelg and last week against Norwood after two quick goals from Matthew Panos. This week Brad Gotch's group will be determined to change this and get out to an early lead against the Tigers. Let's get out to Gliderol stadium on Saturday and support the Panthers and help them as we take the game to the Tigers. Looking further ahead, we have a bye in Round 16 before we are coming back home for Round 17 on Saturday the 23rd of July for another tough matchup against Centrals.